Photo courtesy of David Connell. The Mount Royal University Cougars women’s volleyball team celebrates its first-ever CCAA national volleyball championship March 12 in Saint John, New Brusnwick. The Cougars defeated Vancouver Island University three games to two in the title contest. 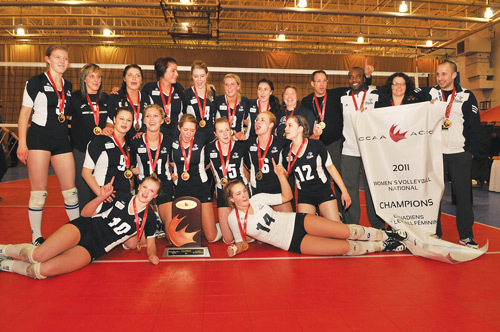 The Mount Royal Cougars women’s volleyball team has made history. The Cougars captured their first-ever CCAA national volleyball championship in New Brunswick March 12, defeating the Vancouver Island University Mariners three games to two. Scores were 23-25, 25-20, 16-25, 26-24 and 15-11. The national title wrapped up an incredible campaign for the Cougars, who finished the regular season with a 19-1 record and then defeated Grande Prairie 3-2 to capture the 13th provincial title in team history. Four players — Julia Pasieka, Andrea Price, Mackenzie Allen and Brenna Estabrook — were named to the ACAC’s provincial all-conference team. Price was also one of ten players named as all-Canadians. For Cougars’ head coach Sandra Lamb, the moment of victory was one she will never forget. “At the exact moment, I was absolutely speechless. I think I still am in some ways,” Lamb said. Going into nationals, the Cougars were ranked third in the country, behind two-time defending champions UBC Okanagan and FX Garneau. VIU was seeded fourth. But in a one-game playoff, rankings mean virtually nothing, as UBC Okanagan discovered after being ousted in the semi-finals and then losing to FX Garneau in the bronze medal tilt. “The rankings are what they are. We never really worried about them. B.C. was the two-time defending champion, so they deserved to be ranked first,” Lamb said. In a season packed full of moments and memories, of the proverbial blood, sweat and tears, picking a single event to share might be difficult for some. For Lamb, however, a hug shared just minutes after the final point was scored truly stands out. “When it happened, people were running around, yelling and celebrating. I was jumping around with them, just totally excited. Then I searched for Diyon (Van Nistelrooy) and we just hugged for a solid minute. Neither of us could say anything. We tried, but nothing would come out,” Lamb said. After the gold medal contest concluded and celebration died down, the Cougars finally had a few moments to themselves and headed back to their hotel around 11 p.m. local time. The night would be short, however, as the team was on a bus to the Moncton airport at 2:30 a.m. for the flight home. The Cougars began the regular season with 18 consecutive wins, before finally dropping their first match of the year, a 3-1 setback to Grande Prairie. Instead of feeling sorry for themselves, the team used the loss as a learning experience. Despite their stellar record, the Cougars realized there was still much work to be done. “There’s no doubt we felt that loss, but it was more about how we responded to it. After it happened, we addressed it, talked about what we wanted to work on, and then didn’t talk about it again,” Lamb said. Instead, the Cougars stuck with their plan, and didn’t lose another match the rest of the season, including playoffs. Lamb said the reason for this was two-fold. First, she identified how the team grew as individuals and as a team. She said a few players really had to look deep within themselves and make positive changes in their lives. Second was intangible, something few people could have predicted. This, quite simply, was a special team. The level of skill and determination, combined with the team’s personality and leadership, made them a force to be reckoned with. “Without any question, this was a special group of players. To go out and battle for five games in both the semifinals and final, against two very good teams, was awesome,” said Lamb. Now the preparations begin for their first national title defense. The Cougars will go into next season ranked first in the country, and they know the bull’s-eye will be squarely on them. Come September, a familiar vision will be shared with the team, one they will commonly share. “In September, everyone has the same 0-0 records. If we want to go out and defend our national championship, we’re going to have to go out and do the same things we did this year,” said Lamb.